I am throbbing slaughter. I am the Emperor's Chosen. I am the Exterminatus! In my centuries lived as a Space Marine, my brothers and sisters, I have seen a fair amount of glorious devastation. I am, after all, the hand of the Emperor; a tool to be used against His enemies and I would rather die in His service than live for myself! When the Orks pillage, I charge valiantly into their lines, for none crave ba''le more than I. When the Eldar begin their magical worship, I tear them asunder and give praise to the Emperor. And when Chaos spreads their foul corruption, I strike forth with a holy vengeance and remain pure in the eyes of our Emperor. I am a Space Marine! So, when I set my gaze upon Warhammer 40K: Space Marine, I knew I would soon be bathing in glorious action, carnage, and suffering! And it did not disappoint me, nor my gristly man-meat, which continues to pulsate with delight! There is so much to love about this game that it is hard to know where to begin. Also where to stop, as my love for this game runs deep, like the rivers of massacre I leave in my wake! Similes! You might find yourself surprised but playing as a Space Marine was not the number one reason I love this game. I've commanded the heroes of Dawn of War 2. I took charge of my brothers and led them into glorious ba''le and to victory! Thus, I am used to seeing Space Marines and Dreadnoughts in action. No, it was a combination of the gruesome, delicious murder-gore and the fact that I have to charge into the fray in order to regain any lost health! I love the chainsword. It could very well be my favorite weapon from any game. The terrible, terrible damage I inflict upon my enemies as I skewer them makes my muscles flex viciously and uncontrollably! I am an Angel of Death and I leave none standing! Though my love has begun to favor another powerful set of tools in which to decimate my enemies! When I strike from the sky with my jump jets, and wield the Thunder Hammer, all falter before my glory and my power! I send my foes to pound town on a carnage carriage now equipped with four horse-powers of pain! The unadulterated butchery I dispense unto the Ork and Chaos filth fills my heart with glee and I squat thrust with happiness! Purge the alien, the mutant, the heretic. Captain Titus's life-force demands he feed his lust for vicious ba''le! When he loses health the only way he can regain it is by mercilessly executing his enemies when they are in a weakened state. There is no cover taking. No regenerating health. Nay! Captain Titus must reinvigorate himself by slaughtering countless foes in rampant, unrelenting combat — the way the Emperor would want it to be! Sure, you can use your Fury to recharge your health after every kill, but I love the challenge of going without it! I need not Fury to regain my life, for I am wrath itself! I am Fury Incarnate! But, without Fury, you are required to fight on, persevere though your injuries and hope the Emperor can protect you long enough for you to regain your life by ending an enemy's! Your conviction will be tested but only then will you know that you are still pure in His eyes! Glory! 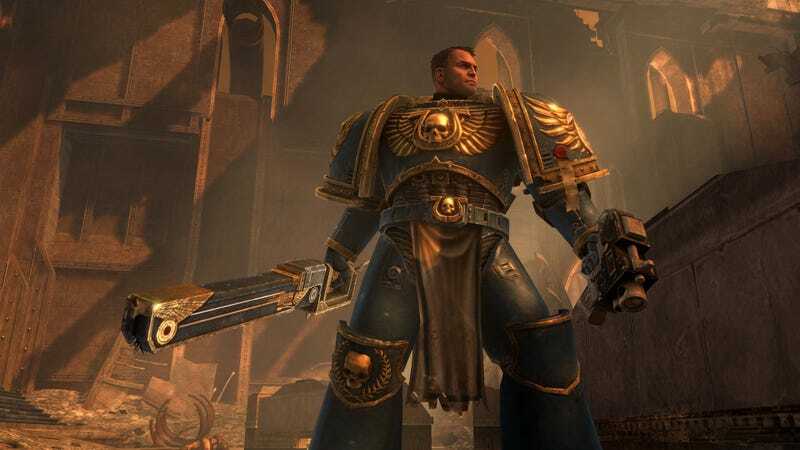 There are, of course, problems with the game (repetitious combat, weak story) however this game caters to those who feel no remorse for slaying the foul and the wicked whom prey on the Emperor's own! Each time I fire up Space Marine I feel my muscles quiver in pleasure! And it is the only game that I forsake weigh lifting for, which explains why I hide it from myself on a regular basis. It's that damn good! And now I am off. Some Nobz need their heads ripped in half! For the Emperor!